GROHE 38773000 Rapid Sl 3-in-1 Set for Wall-Hung Toilet, 0.82 m (Wall Brackets and Skate Cosmopolitan Chrome Flush Plate). Rapid SL 3 in 1 set for WC. Sound transmission to adjoining rooms minimised with GROHE whisper noise control. Reduce your water consumption by up to 50% with GROHE eco joy and pay a smaller utility bill. Spare Flush: additional flush volume for an effective flush, even with old plumbing. 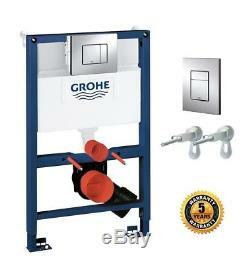 Quick and tool free connection of water supply, flexible hose and inspection shaft. Reduced installation time thanks to GROHE quick fix. Rapid SL installation systems with safety feature are safe for loads of over 400 kg. Skate Cosmopolitan wall plate chrome button included. For dual flush or start & stop actuation. GROHE Rapid SL installation system water-saving toilet flush, as quiet as a whisper. Incorporating a variety of convenient properties, this installation system of the Rapid SL range is quick and easy to install thanks to the GROHE QuickFix technology. No tools are required to connect water supply, hose and inspection shaft. The set comes complete with the Skate Cosmopolitan chrome flush plate. For maximum safety, the steel frame is certified to hold loads of over 400 kg. Installed in front of a solid wall or in a stud wall, the concealed toilet tank and a wall-hung toilet will facilitate your bathroom cleaning. The GROHE EcoJoy dual flush reduces your water consumption by up to 50% and the GROHE Whisper noise control prevents the transmission of sound to adjoining rooms, making the Rapid SL an all-round attractive choice for your home. The GROHE Whisper concealed cistern guarantees noise control. With its low-noise fittings and decoupled piping, GROHE Whisper technology prevents sound travelling through walls. The low noise level of only 21 dB(A) undercuts the standard requirement of 24 dB(A) so you will enjoy total peace and quiet! Its time to cut your water usage and your water bill by up to 50% with GROHE EcoJoy flush technology. Select a flush volume of either 3l or 6l (or 3l and 4.5l, depending on the ceramic body) and, if you want, stop a full flush before its over. Added flush volume for a more effective flush. Give the flush on your toilet a boost with the GROHE SpareFlush system, which provides an extra 3l of water even in buildings with old plumbing. Connect with ease in seconds thats ToolFree. No tools are needed to connect your water supply, flexible hose and inspection shaft. Thats our innovative ToolFree concept. A concealed system thats simple to install thats GROHE QuickFix. GROHE QuickFix makes installing a concealed system quick and easy. In a test of installation times carried out by Germany's REFA association it outperformed competitors by up to 155%! 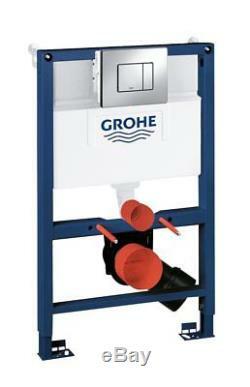 GROHE Rapid SL toilets can take a load of 400 kg. Safety is the name of the game with your GROHE Rapid SL installation system. The steel frames of the wall-hung toilets and basins are certified to hold up to 400 kg and 150 kg, respectively. The choice of 130 complementary designs. The universal base plate matches all our flush plates so you can choose from over 130 attractive designs. 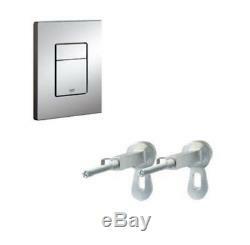 They are also easy to install and can be mounted either horizontally or vertically. Connect the flush plate and drain valve easily with EasyConnect. Theres no need to measure or cut the hose because it simply plugs onto the drain valve and flush plate. Concealed cistern connection made simple! With our VarioPort system you the supply hose to the water supply at four points: front, rear, left and right. Easy installation with a single drain valve. With a single drain valve for all flush modes including single flush, dual flush and start-stop technology mounting the installation system is quick and easy. High shine chrome coating makes cleaning easy. GROHE Starlight chrome coating on taps means you can just wipe them down with a dry cloth no marks, no streaks, no water spots. The ultra-bright surface is scratch-resistant so will keep its original lustre with minimal maintenance. We are not responsible for any lost items left outside your door, neighbours or any other place where you have instructed us to do so. All prices are VAT inclusive. You can cancel your order within 7 days of receiving the item. You must inform us in writing about the cancellation of order as soon as possible. You have an obligation to take care of the product and all its parts. We thrive to dispatch the orders as soon as we receive them, therefore, it might not always be possible to cancel your order. We use third party couriers and in very few cases the outer packaging gets damaged in the transit. We might ask you to take photographs of the packaging so that we can investigate it with our courier. If you think the product is faulty and not functioning properly, please let us know as soon as possible. Please take good care when packing the product for a return as we will not be responsible for any damage caused during the transit. Please always include your name, order details, and the reasons for return when you return your items. In all instances, please do not return any items without contacting us first so that we can register your return in our system. RETURN ADDRESS: PLUMB2U UNIT 5 EPSOM BUSINESS PARK KILN LANE EPSOM SURREY KT17 1JF. 2 Prices & Payments All prices are VAT inclusive. In case you change your mind. Please remember, you are responsible for cost of returning the items to us. YOU MIGHT BE INTERESTED IN. 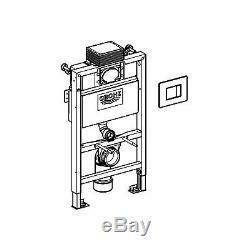 Triton T30i 3Kw 240V Over Sink Electric Hand Wash Water Heater Unit White. Bristan Artisan Bar Thermostatic Bar Mixer Shower Kit VA BARSHXSM C. Bristan Value lever Basin Sink Taps With Ceramic Disc Valves Chrome VAL 1/2 C CD. Calmag SI Calcombi 22mm 15mm Scale Inhibitor Electrolytic Magnetic. Aqualisa Colt COLT001EA Exposed Thermostatic Chrome Mixer Shower. 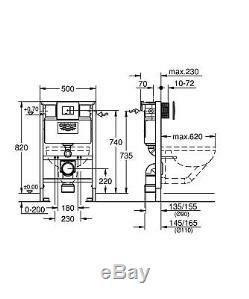 Bristan Wall Mounts For Bar Shower Mixers WMNT10 C. Bristan R 1/2 C Regency Basin Taps - Chrome. Stuart Turner 46415 Brass Monsoon 2.0 Bar Twin Positive Head Shower Pump. The item "GROHE 38773000 Frame Rapid Sl 3 1 Set Wall-Hung Toilet 0.82 m wall-Flush Plate" is in sale since Wednesday, May 2, 2018. This item is in the category "Home, Furniture & DIY\Bath\Toilets & Bidets\Toilets". 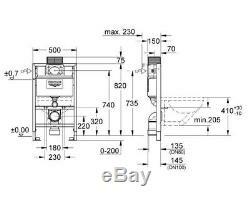 The seller is "plumb2u" and is located in GB.